Mogami Overdrive Guitar Instrument Cables are designed for electric guitar applications to reveal more presence, dynamics, and upper-frequency definition. For tone purists who make the most of the stage, this is your cable. Engineered to deliver the original sound of your instrument and effects without coloration, Mogami Overdrive Guitar Cables exhibit an extraordinarily extended and detailed sound quality. For the most synergistic results, use an all-Overdrive signal path between your guitar, pedal board, effects, and amplifier. For even more mid-range energy and punch, complement your Mogami Overdrive Guitar Instrument Cables with a matching Mogami Overdrive Speaker Cable for your amp-to-speaker-cabinet connection. Maximum, uninhibited performance with amazingly superb tone! For quiet hot-swapping between instruments, Mogami OD GTR SILENT R Overdrive Guitar Instrument Cables are equipped with a right angle Neutrik silentPLUG going to a straight connector. Available in 12 and 20 foot lengths. Mogami Lifetime "No Excuses" Warranty: all brand new Mogami cables include Mogami's Limited Lifetime "No Excuses" Warranty to the original purchaser and are proudly supported by Mogami and their dedicated network of Authorized Resellers. Please reference the entirety of Mogami Cable's Limited Lifetime "No Excuses" Warranty specification for complete details. Mogami Overdrive Guitar Instrument Cables are designed for electric guitar applications to reveal more presence, dynamics, and upper-frequency definition. For tone purists who make the most of the stage, this is your cable. Engineered to deliver the original sound of your instrument and effects without coloration, Mogami Overdrive Guitar Cables exhibit an extraordinarily extended and detailed sound quality. For the most synergistic results, use an all-Overdrive signal path between your guitar, pedal board, effects, and amplifier input. For even more mid-range energy and punch, complement your Mogami Overdrive Guitar Instrument Cables with a matching Mogami Overdrive Speaker Cable for your amp-to-speaker-cabinet connection. Maximum, uninhibited performance with amazingly superb tone! 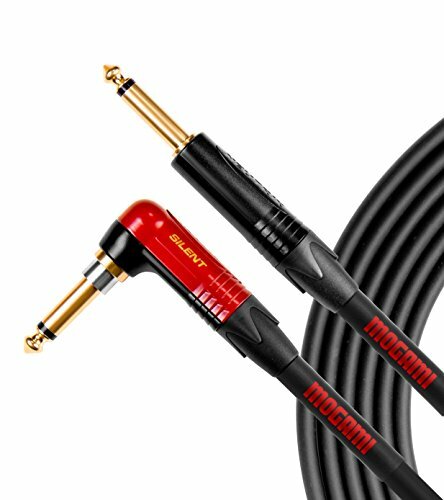 For quiet hot-swapping between instruments, Mogami OD GTR SILENT R Overdrive Guitar Instrument Cables are equipped with a right angle Neutrik silentPLUG going to a straight connector. Available in 12 and 20 foot lengths.